Have you ever been to a Japanese garden in Japan? Well, there’s no need to get an expensive airplane ticket to experience a very accurate and beautiful recreation right here in the Los Angeles area. 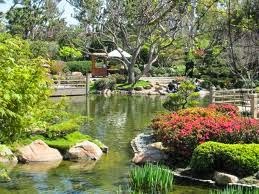 The Earl Burns Miller Japanese Garden is located in the Cal State Long Beach campus next to lot 16. Similar to the many gardens in Japan, details and intricate care were placed into creating an authentic and unique atmosphere. It almost feels like it was transported all in one piece from Japan. The garden is popular for weddings, dates, and all photography enthusiasts. It’s a great place to relax, take a stroll, or even take a nap. It’s a hidden little treasure worth visiting. So next time you want a charming or authentic experience, consider a trip to the CSULB campus. Hours are: Tuesday through Friday from 8:00 am to 3:30 pm, Sunday from noon to 4:00pm, but it’s closed on Mondays and Saturdays. Oh yeah, did I mention? It’s FREE.